About PAFFY'S PEST CONTROL, INC.
"A" rating with the BBB. "A+" rating - Angies List. What people say about PAFFY'S PEST CONTROL, INC. Thank you, for your great service. Bart was on time and knew what he was doing. Very professional. Thanks! Worked with Paffy's for years. Paffy's service team always listens to you and will go the extra mile to help us with our pest control needs. I am a local realtor and have used them personally and recommend them to all of my clients. Paffy's service tech was very thorough with his inspection and detailed report. Always happy, competent and willing to do the job til it is solved! The owner is awesome and provides great leadership! A favorite vendor! Great work as always! Thanks Paffy's! Thank you for keeping my business pest free! We have been using Paffy's Pest control for a long time now and over time they keep working on how to better their services which we appreciate as a business. Bryan our main tech has been such a wonderful person to work with. He is so professional and can handle situations very well. Dwayne the owner has been very accommodating and a blast to work with as well with whatever we need for our buildings. Thank you Paffy's for continuing to service our properties and being there when we need you. Very prompt service. Extremely knowledgable and they treat you like family! Great vendor! They are prompt, they are polite and they are very knowledgeable! I cannot imagine having a different company for extermination. I have worked with them for years and my team and I would not have it any other way. A quick response and great service! Thanks! Excellent fast service. Friendly folks over the phone and in person. No more ants! Thank you! All possible spots of mice entering were found. Poison in containers were placed in several spots. Mice eating the poison could be heard. Even a shrew was trapped! With the wife having cancer surgery this week, we feel safer in our house. Very happy since we have not seen any little critters! Paffy’s has been a lifesaver over the past 8 years. They have helped us with seasonal scheduled pest control and with urgent issues as well including carpenter ants and mice. They are very thorough and timely, we really appreciate their responsiveness and commitment. Thanks Paffy’s!! Yes, very happy, my house is my home again without the fleas. Thanks to the great tech who was out and sprayed my home, very very happy! Just started with you to early to tell if it is working. Staff is very knowledgeable and courteous. Thank you for being super responsive to our mouse issue and coming back to make sure that they were truly gone. Your staff is super nice, too! One of the things I like best about Paffy's is that they are a local, family-owned company. They really care about their customers and are always willing to accommodate my schedule and needs. It's only been less than 2 weeks since I had my initial service but I have no longer seen mouse droppings or heard them in my attic and walls. I am also impressed how friendly and on top of things everyone seems to be when I've contacted them. Very responsive. Worked with our pesky pest problem and saw the problem through. I like having your service on a regular basis and keeping pest under control. Paffy's have consistently been responsive to our pest control needs, whether that is on an immediate need, or by being proactive in prevention services. I would recommend Paffy's to anyone who is seeking a pest control service. I think the treatment has taken care of the problem. The service tech was very friendly and informative. Very Professional and solved my problem quickly! Paffy's has been wonderful to work with. Living in the country brings lots of critters and thanks to Paffy's the wild stays in the wild. So far so good - no spiders, bugs, or mice. But the real test will be over the winter when we’ve had mice problems for several years. Are you coming to my apartment again this Saterday? Excellent service, will work with you and come back if you have any issues. Thanks again. We've been using Paffy's for years. Great service. They came out the next day! The technician was courteous and knowledgeable. I will recommend them to all my friends and family. 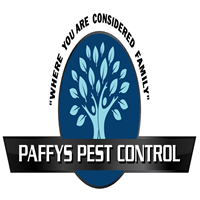 Our family is located in Michigan and my aunt's home is in Minnesota and Paffys Pest Control was outstanding in helping us get our aunt's house treated for fleas. They were compassionate, understanding and super helpful -- beyond the call of duty. I highly recommend them. They treated like it was there family in need. We are repeat customers. Jay does a great job for us every year.